Najiba, 38, is married with eight children—five daughters and three sons. She is illiterate. Mazar-e-Sharif — Gender violence in my family means that my husband always gives much more freedom and money and everything good to my sons and not to my daughters. My sons are always first and my husband does not allow my daughters to go to school. He lets my sons go to school and every day he gives them money to spend at school with their friends. What is gender violence? The story of what goes on in my family itself is gender violence. I think in my country we cannot see what we hope to see with gender violence. Every day gender violence is increasing, even in educated families. My husband and I, we are not educated, but when I see or hear of violence from educated families, then I know that violence can exist in all families. A year ago my own rights were violated when I was working in a house, cleaning and washing the clothes. There was a very bad woman who always did violence on her daughter-in-law in that house. One day I said to her, “Your daughter-in-law is a good woman, why you are bad with her?” Then she kicked me out from her house and she did not give me my salary that day. I don’t know what the government is really doing. I am just an illiterate woman. But why are the other women silent? To stop gender violence in society I think the men of the families must be forced by government to stop violence in their families. They should not beat their wife and their daughters. The high authorities should have awareness. We can encourage girls and women to struggle against violence by going to school and getting jobs and not letting the men do violence to them. That is my message. Thank you for giving me this chance to say my words to you. 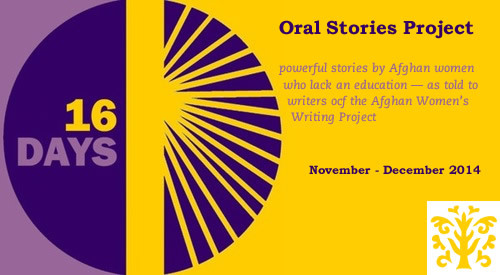 By Naijba, as told to Humaira G.
Najiba was interviewed as part of AWWP’s participation in the Sixteen Days of Activism Against Gender Violence campaign for 2014.